NASA’s MESSENGER mission came to an end at 3:26 p.m. EDT (19:26 GMT) on Thursday, April 30, when the spacecraft impacted the surface of the planet Mercury at more than 8,750 miles (14,082 km) per hour. 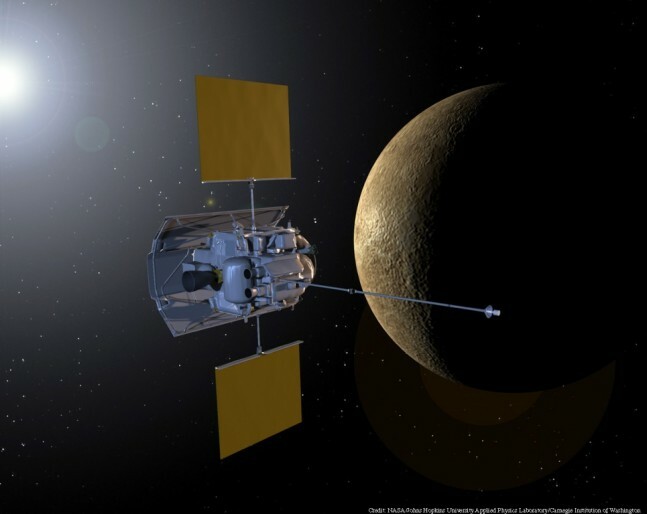 After nearly 11 years in space, four of which were in orbit around the tiny world which orbits closest to the Sun, MESSENGER had exhausted its supply of maneuvering fuel and was no longer able to make adjustments in its orbit. The crashing spacecraft added a new crater, estimated to be about 52-feet (<16 m) wide, to the planet’s scarred surface. MESSENGER was only the second spacecraft to closely study Mercury and the first to orbit it. 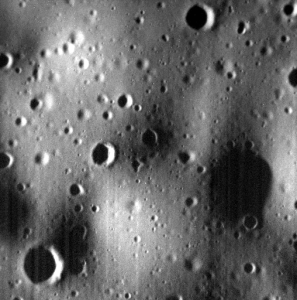 NASA’s Mariner 10 spacecraft conducted three flybys of Mercury during 1974-75. The MESSENGER mission has greatly expanded on what scientists previously knew about Mercury. The MESSENGER Spacecraft was launched on August 3, 2004, atop a Delta II rocket from Space Launch Complex-17-B at Cape Canaveral Air Force Station. The space carried a payload of seven scientific instruments and a radio science experiment. The payload was limited to 110 pounds (50 kg) because of the propellant mass required for orbital insertion. 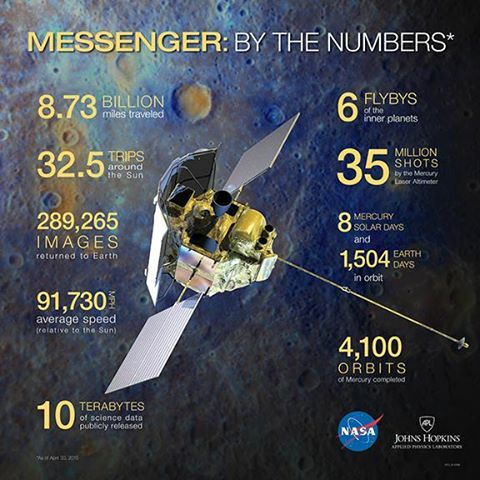 MESSENGER traveled in space for over six and a half years and made three flybys of Mercury before being inserted in orbit around the planet on March 24, 2011. The spacecraft completed its one year primary mission in 2012 and received two mission extensions, stretching its time in orbit around Mercury to nearly four years and sending back over 250,000 images of the planet’s surface. One of the most significant achievements of the mission was the finding of compelling evidence that Mercury harbors abundant frozen water and other volatile materials in its permanently shadowed polar craters. A dark layer covering most of the water ice supports the theory that organic compounds, in addition to water, were delivered from the outer Solar System to the inner planets. The next robotic exploration of Mercury will be by the BepiColumbo mission, a joint effort by the European Space Agency (ESA) and the Japanese Space Agency (JAXA) that is scheduled to launch in early 2017. The two orbiters of the BepiColumbo mission will be inserted into orbit around Mercury 2024. The orbiters will explore Mercury for one year, with the possibility of a one-year extension.